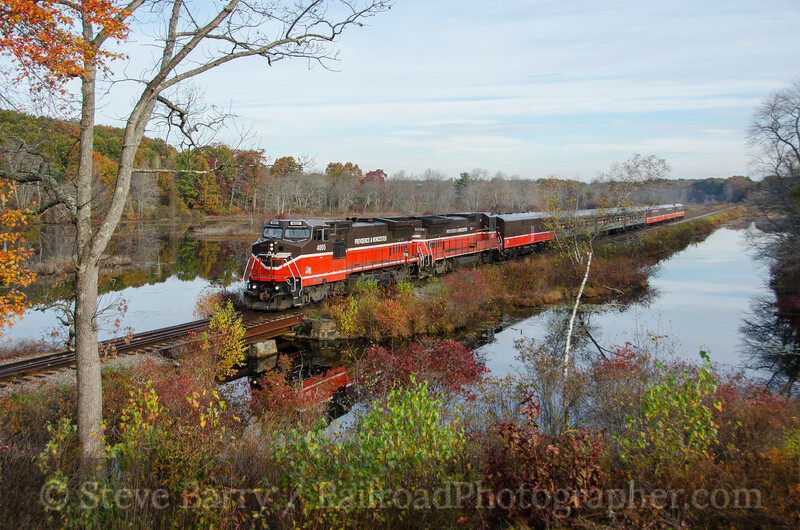 Trackside Travels: The Last Providence & Worcester Passenger Train? 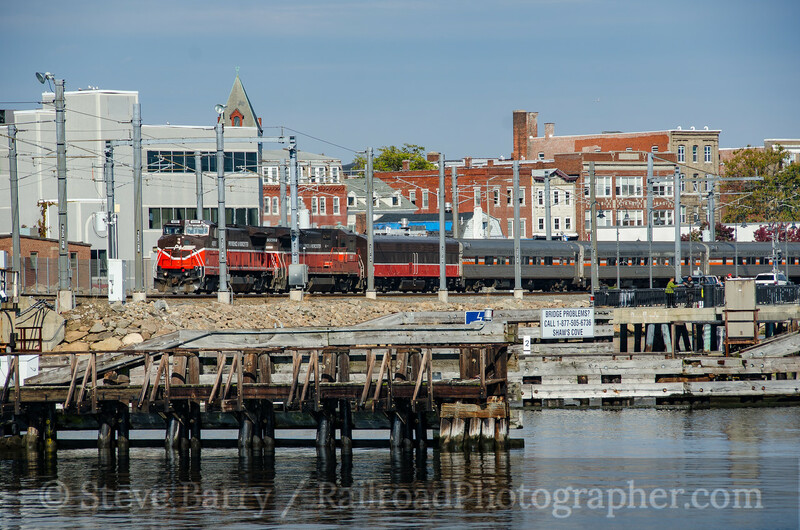 The Providence & Worcester, a regional railroad based out of Worcester, Mass., has maintained a small passenger car fleet for occasional excursions. 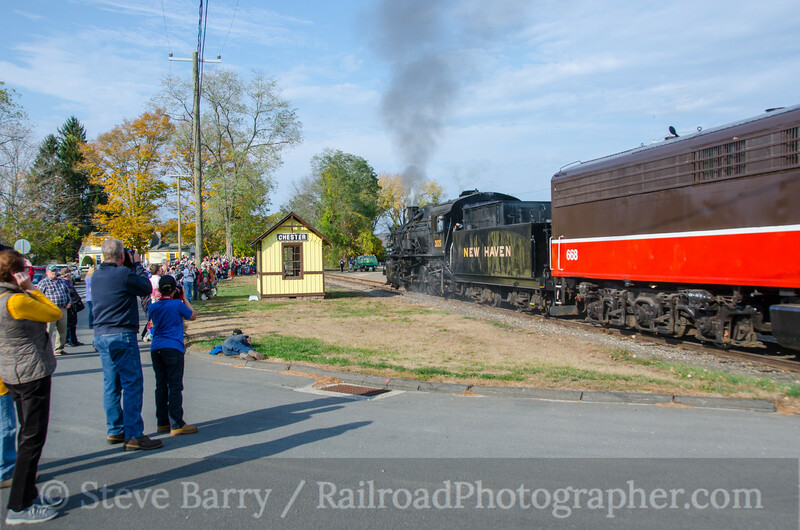 Many of those trips have been sponsored by the Massachusetts Bay Railroad Enthusiasts, a group based in the Boston area. 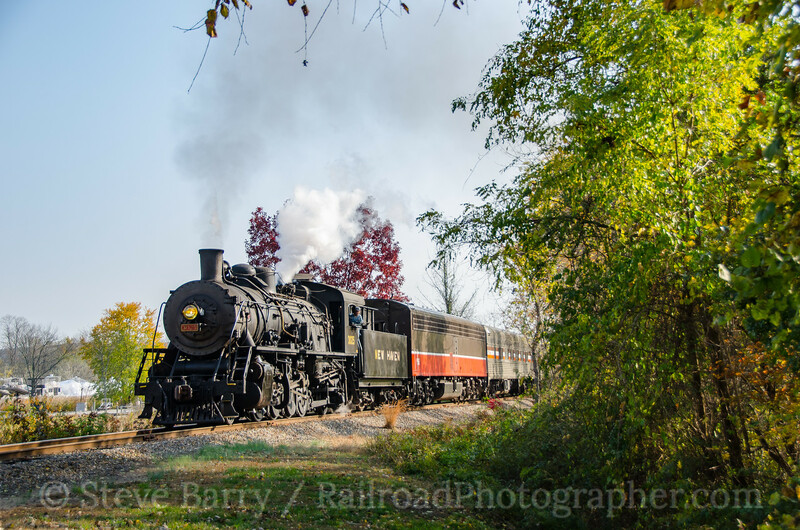 The railroad and group announced the "Two Rivers Steam Special," scheduled for October 29. The trip would run from Worcester to Groton, Conn., on P&W rails, get onto Amtrak's Northeast Corridor from Groton for the trip across the Thames and Connecticut Rivers (the two rivers in the trip's name) to a connection with the Valley Railroad at Old Saybrook, Conn. From there the P&W diesels would be taken off and a Valley Railroad steam locomotive would take the train up the Valley to Haddam, Conn. Once there, the whole trip would be done in reverse to get back to Worcester. 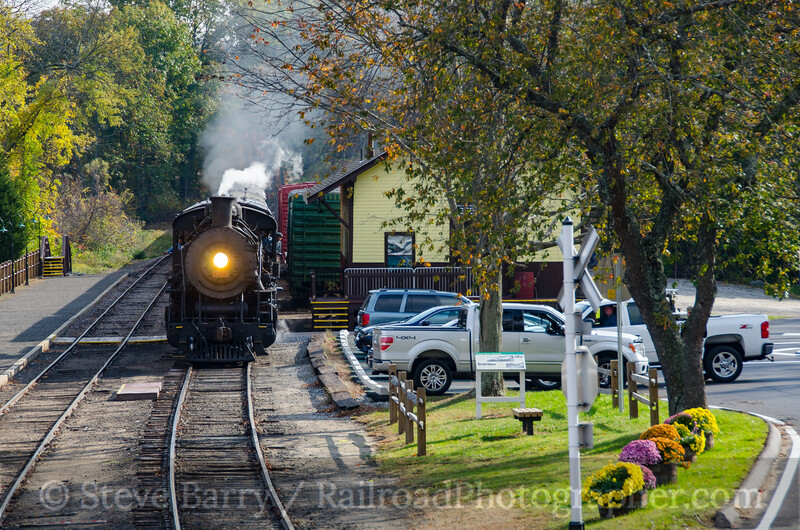 The October 29 trip sold out rapidly, and a second trip was added for October 30. But after the trips were scheduled the news broke that the P&W had been sold to shortline conglomerate Genesee & Wyoming Industries. Judging by GWI's other railroads, passenger operations are frowned upon. 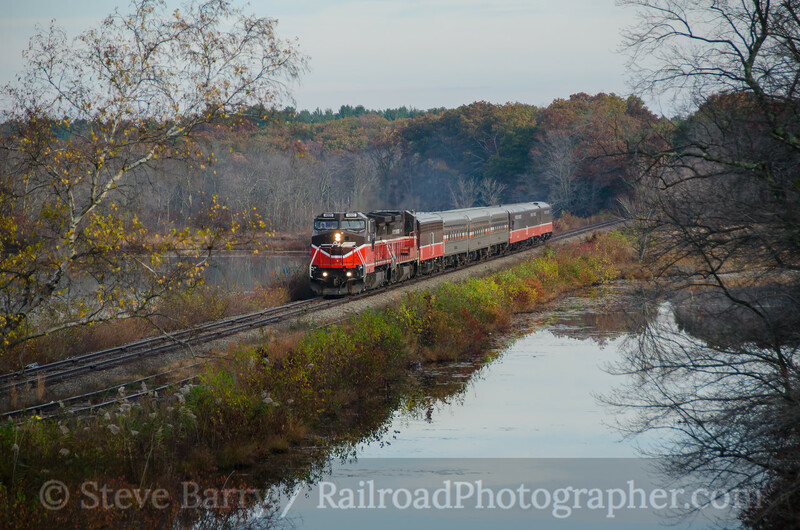 With a transfer date of November 1, it was apparent the October 29 trip could very well be the last P&W long-distance passenger trip (GWI has committed to running previously announced short Santa trains out of Woosocket for the holiday season). 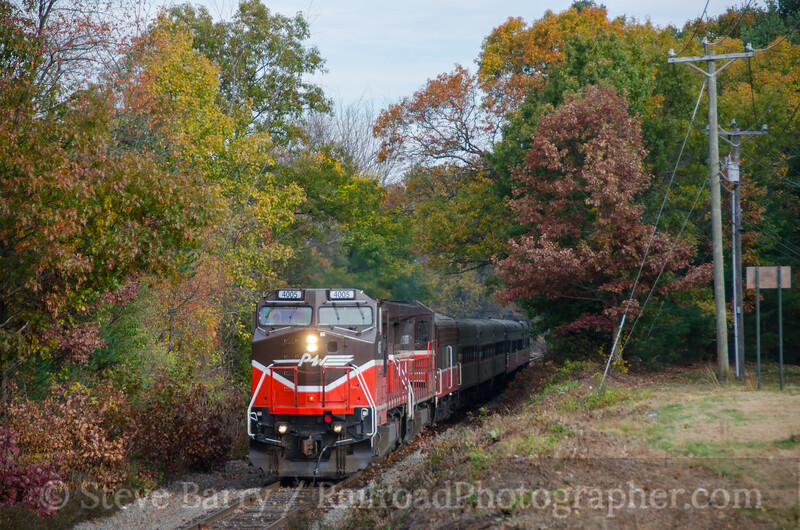 Since I was in Connecticut for another event on Saturday the 29th, I decided to stick around and chase that last train on the 30th (along with my brother Bruce). Our first stop was at a causeway just north of the village of Webster, Mass. (above and below). The train made a stop at Putnam, Conn., to pick up additional passengers. This gave us enough time to get ahead of the train just south of the stop at Attawaugan. The telephoto view showed the train emerging from the woods. 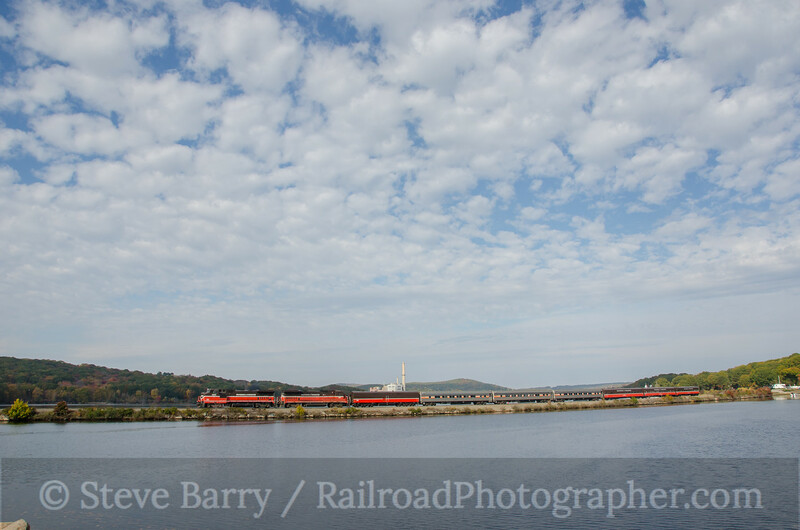 From the same spot, the wide angle view showed just a hint of color on this late autumn day. P&W B40-8W No. 4005 had the honor of leading this day's train. 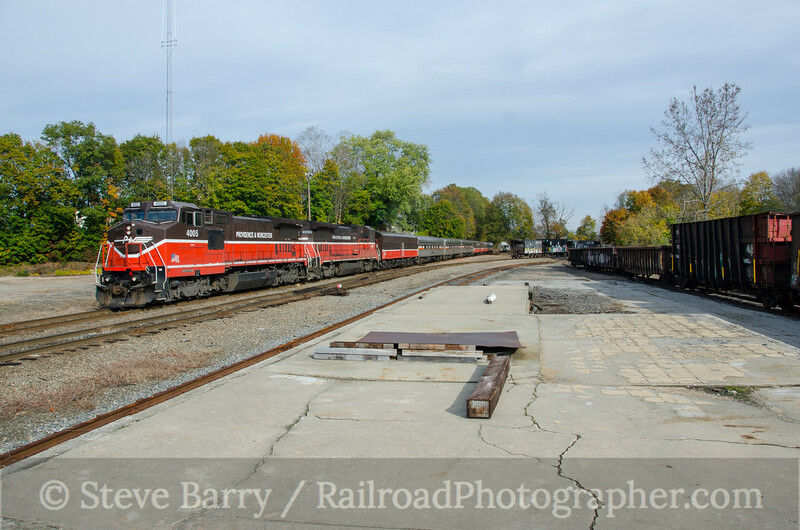 Getting ahead of the train again, our next shot was from what is left of the freight depot in Plainfield, Conn. The structure has been removed, leaving only the foundation and floor. We knew the train had to go slow for the next few miles due to track conditions, so we were able to get ahead of it again just below Plainfield (left). From here the train rolled through Jewett City and Norwich. We were unable to find any decent photo angles on this stretch, so we went further south and checked out some of the coves off the Thames River that the railroad crosses on causeways. We settled on Mill Cove just north of the Naval Submarine Base at Groton (below). Just below the submarine base (the railroad passes right through it) the train needed permission to get onto Amtrak's Northeast Corridor. Once there it would cross the Thames, pass the New London station, and cross Colt's Cove. We set up on the west end of the movable bridge over Shaw's Cove. A telephoto lens let us shoot the train as it snaked along the Thames just west of the New London station. 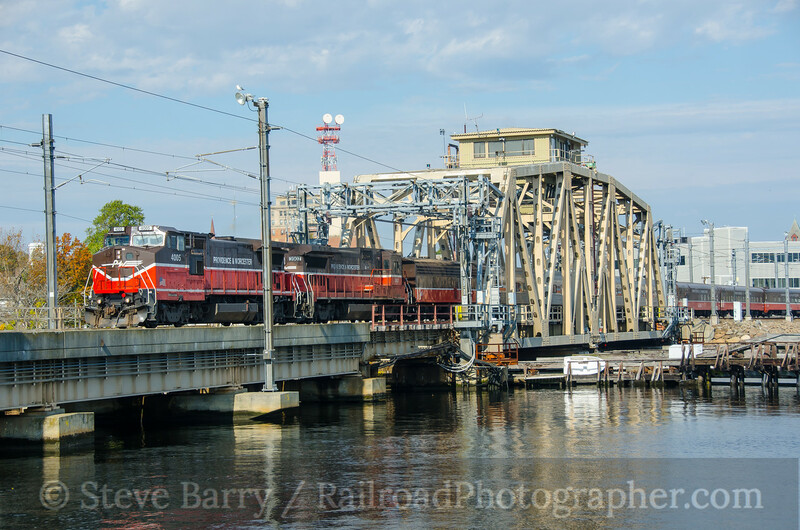 A wide-angle view shows the train coming off the swing bridge. 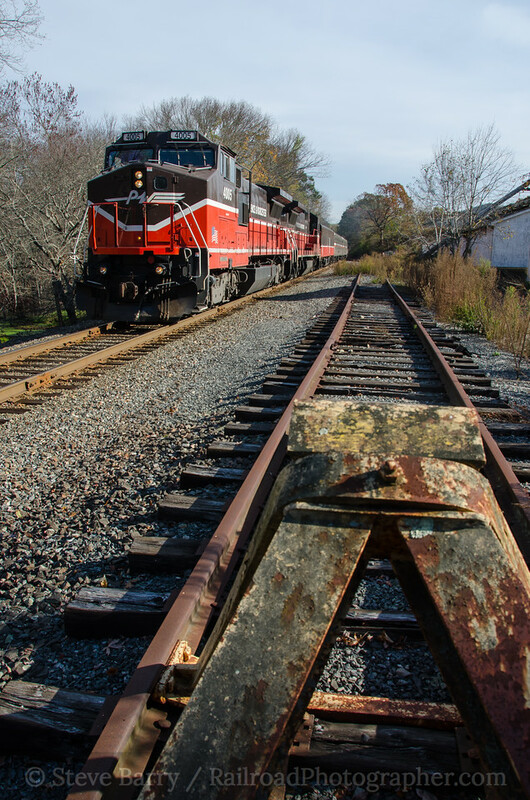 From New London the train would go to Old Saybrook, where the diesels were taken off the train. Here the train would get onto the Valley Railroad and the motive power would be the Valley's 2-8-2 No. 3025, lettered for the New Haven Railroad. No. 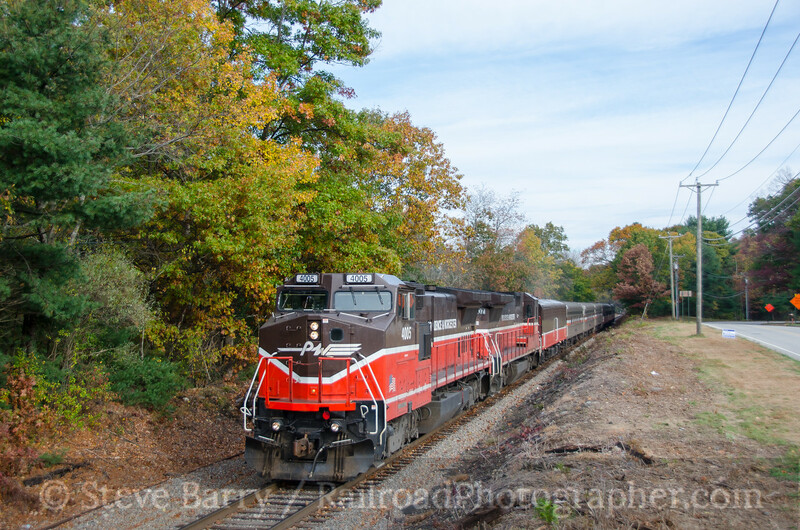 3025 is actually a fairly new locomotive, built in China in 1989 and imported to the U.S. We headed north up the Valley and waited for the train at the depot at Deep River, along the Connecticut River. The passengers had been on the train since its 8:30 a.m. departure from Worcester, and it was now after 2:00 p.m. Finally, the passengers got a break when they were let off for a photo runby at Chester. It was obvious the locomotive crew was enjoying the runbys -- they really made No. 3025 work as it stormed past the assembled photo line. A second runby was performed. 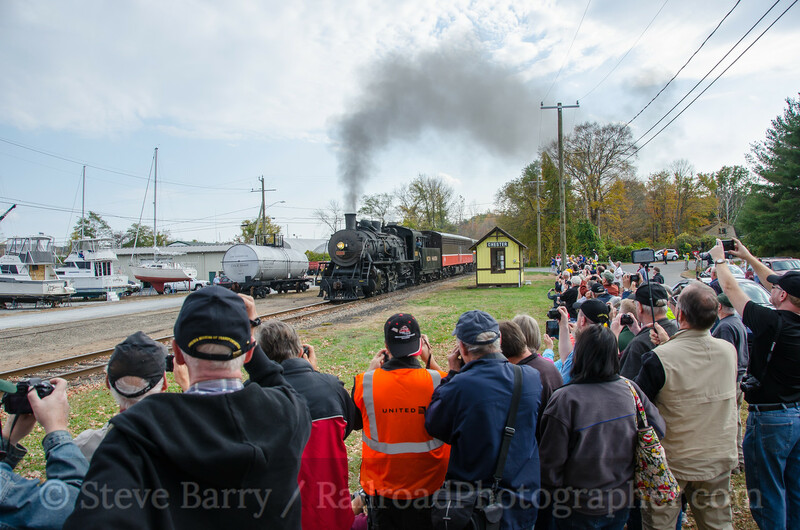 The second runby was just as good as the first, so the railroad personnel asked the crowd if they wanted a third runby! The response was an enthusiastic "Yes!!!!" 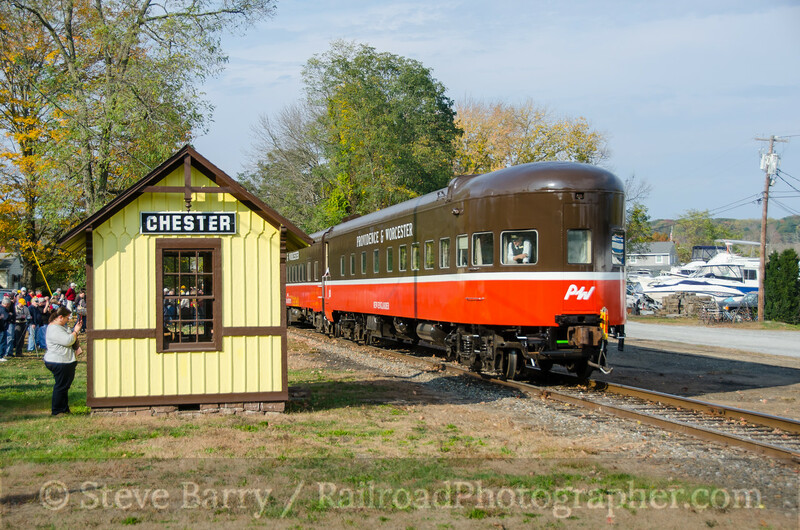 The observation car rolled past the Chester depot. Sadly, it might be the last time this car -- and the rest of the passenger consist -- would be visiting a foreign railroad. After the passengers reboarded, the train continued another few miles up the Valley to the end of the line. Our final look would be at the first grade crossing north of the runby location, watching No. 3025 accelerate the consist northward. Encroaching clouds and approaching rain would end our day; for those on board, there was still half the trip to go to get back to Worcester. 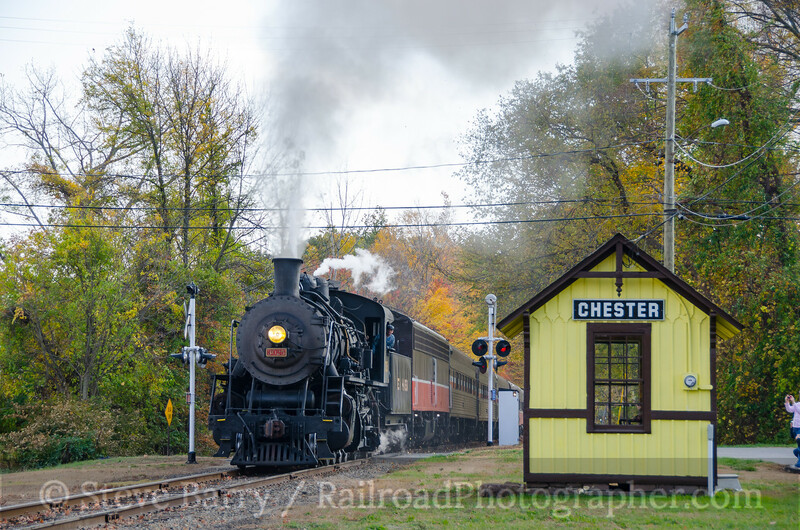 It won't be long before we know if Genesee & Wyoming will continue the tradition of passenger trips on the Providence & Worcester; as stated above, GWI will honor previously scheduled short holiday trips out of Woonsocket later this year. But beyond that? Who knows... This trip may have very well been the last long-distance passenger train on the Providence & Worcester.